Even single RPG fans will have a great Valentine's Day in 2011. Square Enix has announced that it'll complete the Dragon Quest circle by releasing the Nintendo DS version of Dragon Quest VI: Realms of Revelation in North America in 2011. This release will complete the franchise's Zenithia trilogy on the DS in addition to totally filling out the main Dragon Quest title roster (excluding spin-offs) in the U.S.
Dragon Quest VI has never been released in North America before, despite being released in Japan in 1995. Square Enix has been releasing the DS versions of the Zenithia trilogy in the U.S. since late 2008, which starts with Dragon Quest IV and typically involves a special set of equipment, a castle in the sky, and dragons. Thankfully, Square is being gracious enough to complete it for North American fans. On the DS, the trilogy has been completely upgraded from its SNES roots with new graphics, features, and gameplay alterations. Dragon Quest IV follows multiple characters and their individual storylines until they eventually converge to save the world. 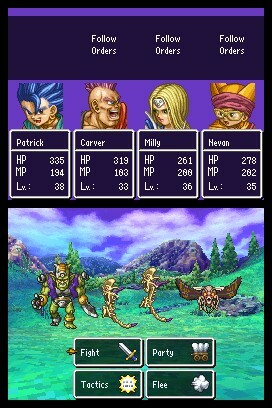 Dragon Quest V focuses on a hero's successive family generations and the monster companions the player can recruit. Dragon Quest VI introduces multiple worlds and character classes (also seen in Dragon Quest VII), with some fans considering it one of the best in the series. Square Enix's Dragon Quest release schedule might seem odd to an outsider, as it just released Dragon Quest IX in July 2010, but it's truly worth it to go backwards for RPG fans that haven't played the franchise's previous entries. Just make sure you have your priorities straight, because Dragon Quest VI will be released in North America on February 14, 2011, otherwise known as Valentine's Day. Depending on one's relationship status, it might not be the best day to put 8 hours into a JRPG, but it'll definitely be worth sneaking out to the videogame store just before it closes.